DCE AutoEnhance is a stand-alone batch processor to get great sparkling images with vivid colors, with just the right color balance and all the pro-look. We now offer similar tools also as a set of Adobe Photoshop plug-ins. See more here. Please check compatibility with your applications. DCE AutoEnhance will help you with the time consuming job of adjusting and enhancing many of your daily digital images in a whole new automatic way. 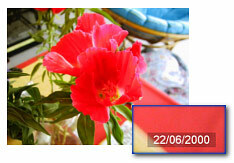 It reads the Exif information from JPG images and then process it accordingly. Auto Balance will fix what your camera missed. Also the contrast will be improved. Sometimes the day is just amazing. Lots of sun, all around is green. You take the picture, and it is quite good. But just good. It doesn't capture the crispness of the day. The problem is that the camera add a blue cast to the image. You may not see it without the fix, but when you look at the result you should notice the greens are much improved. We included a specially developed Portrait Soft De-focus filter with enhancing flesh tones. The skin of your portrait model will become smooth, yet the other details will remain. The skin will even get better tone. Sometimes you would like to put back the colors you remember.The Enhance color option will allow you to boost saturation without over-doing it. The CCD of digital cameras naturally suffer from "Hot Pixels". These are white dots which appear on the image after you use a long exposure. The Hot Pixel Removal is attached to a Shutter Speed recorded in the image metadata. That means it will be automatically used only where needed. You can add a text or even an Exif data such as Date, Time, Model, F-number, Shutter speed or ISO. It makes your images looks professional but also gives you instant overview of the parameters or the date when the shot was taken. 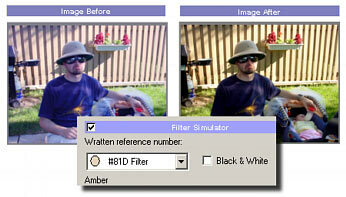 This can help you to tone your image much like the real-life glass filters would do. You simply choose the filter by its reference number (Wratten/Tiffen) and watch the image change its feel. Powerful filter for portrait photography cleans the models skin and enhance the tones. Allows you to add a text on every image such as your copyright message etc. The best is to download Trial Versions and test them with your application to see if it is compatible or not. series of seven professional Photoshop plugins for correcting, enhancing and fixing the most troublesome problems with today digital photography. If you are after Adobe Photoshop(tm) plug-ins, check this.